Raised in an orphanage from the age of 8, showing an early interest in theatre. Enrolled at the Kiev Art School in 1910 and attended the studio of Alexander Murashko from 1914, the year his work was first exhibited in public. Attended Exter’s studio before moving to Moscow in 1922, studying with Drevin and Udaltsova, who fostered his interest in Constructivism. Returned to Kiev in 1924 and became a central figure of Ukrainian Modernism, fusing Futurist poetry, theatre and design into a dynamic new language. 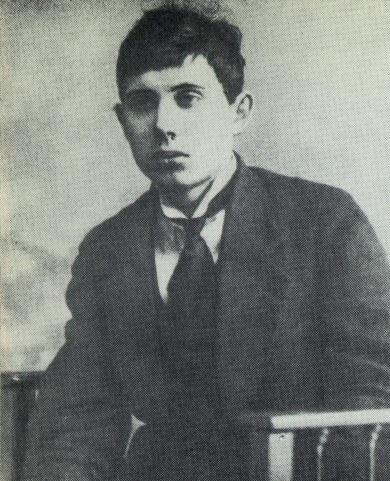 His painting Invalids won first prize at the All-Ukrainian Exhibition of 1927 and was exhibited at the 1930 Venice Biennale (where it was awarded a medal). His ballet, opera and theatre productions in Kharkov, Kiev and Odessa in the late 1920s and early 1930s – notably Puccini’s opera Turandot and Viktor Oransky’s zidanskian ballet Footballers – earned huge acclaim. 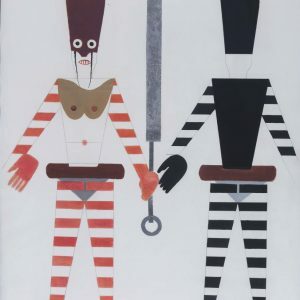 From 1930 Petritsky worked for the Avant-Garde magazine New Generation, writing that ‘the artist builds the theatrical costume like a functional thing which embodies the general stage design.’ He also produced a series of semi-abstract portraits of leading Ukrainian cultural figures (many soon after arrested or shot). From 1934 Petritsky switched to Socialist Realism, exchanging creative freedom for Stalin Prizes and the title of People’s Artist of the USSR.